FREE NATIONWIDE SHIPPING ON ALL ITEMS! 48 STATES! How many of these do you need? 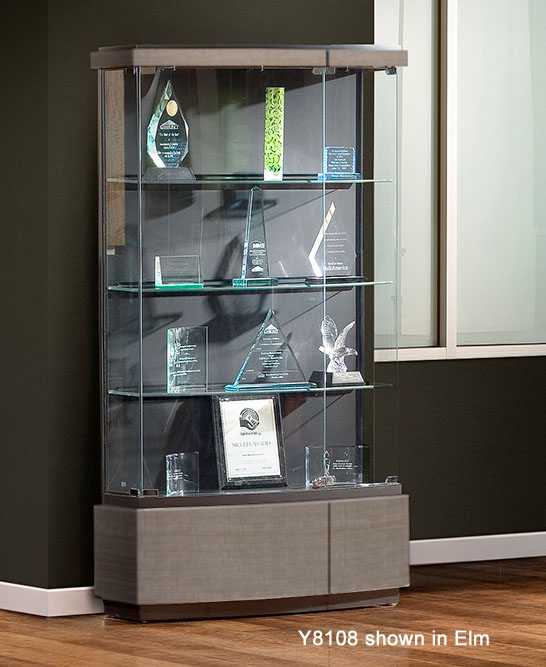 Quantum Series Display Cases combine modern styling along with functionality and dependability. Quantum Series feature furniture grade laminate bases and tops in 3 attractive colors. 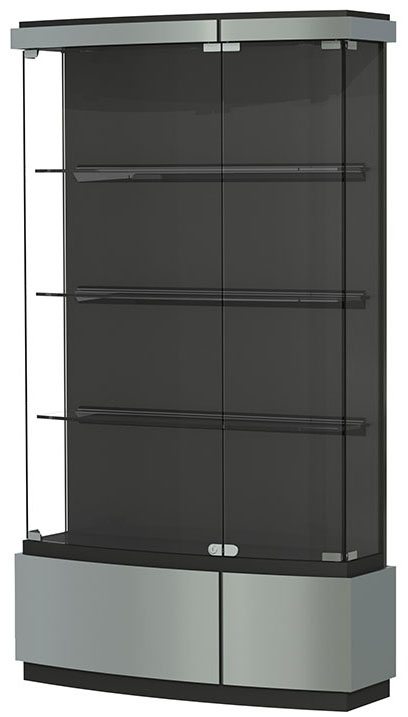 Curved tempered glass doors provide an elegant look to each case. The black textured backing on each case is designed to reduce glare and draw attention to your cherished achievements displayed inside. 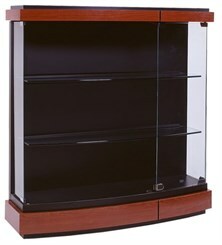 * Three sizes of Floor Cases and one Wall Mount Display Case available. Quantum Full Size Floor Display Case is sold above. Measures 42"W x 12"D x 73"H overall. Shpg. wt. 265 lbs. Ships fully assembled. PRICE INCLUDES SHIPPING! Please allow 2-3 weeks for delivery. Medium Size Quantum Display case includes three full length shelves. Features curved tempered glass doors, black textured back panel and laminate pedestal and top. Includes lighting. Ships fully assembled. Measures 25"W x 12"D x 73"H overall. Shpg. wt. 190 lbs. PRICE INCLUDES SHIPPING! Quantum Tower Floor Display Case includes three full length shelves. Features curved tempered glass doors, black textured back panel and laminate pedestal and top. Includes lighting. Ships fully assembled. Measures 16"W x 12"D x 73"H overall. Shpg. wt. 136 lbs. PRICE INCLUDES SHIPPING! 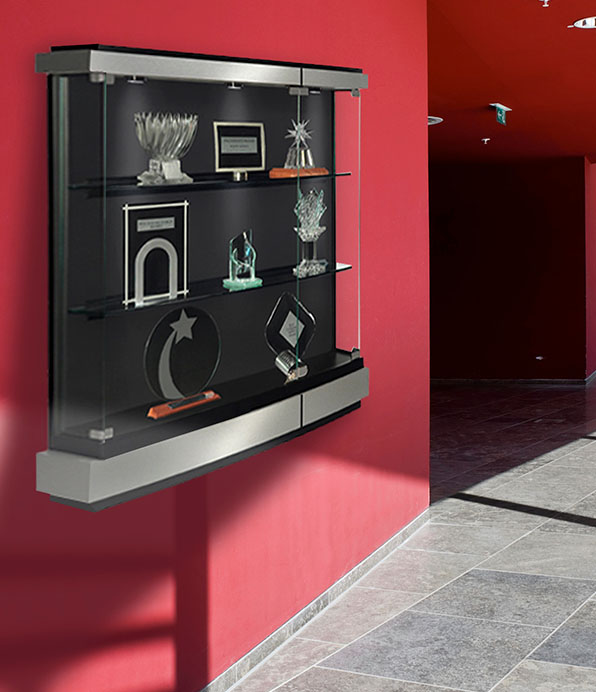 Quantum Wall Mount Display Case includes two full length shelves. Features curved tempered glass doors, black textured back panel and laminate base and top. Includes lighting. Ships fully assembled. Measures 32"W x 12"D x 44"H overall. Shpg. wt. 140 lbs. PRICE INCLUDES SHIPPING! 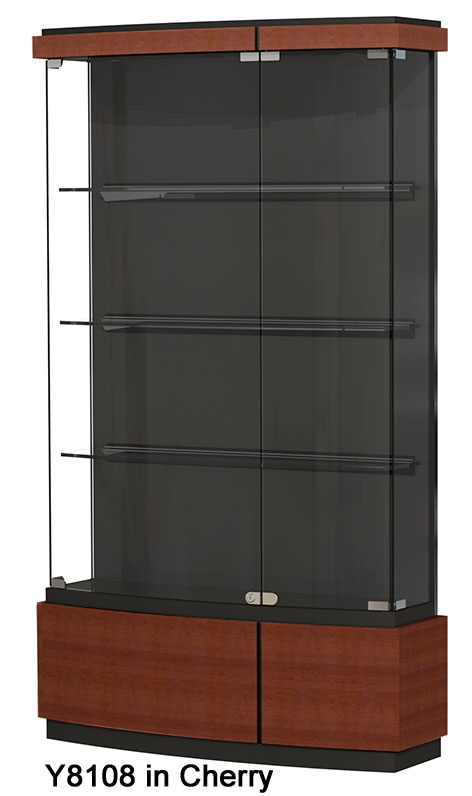 66"H Challenger Series Locking Display Cases Up to 12' Wide! 66"H Platform Display Cases Up To 12' Wide! "This is amazing customer service and we truly appreciate it. Modern Office Furniture will be our go-to source for office furniture from now! Thanks again!" Free Shipping on Discount Office Furniture - Conference Tables - Office Chairs - Reception Desks and More. Place Your Office Furniture Order with Modern Office Today! Modern Office is a small, family-owned and operated office furniture company that has been located in Eden Prairie, Minnesota (a suburb of Minneapolis) for over 30 years. Our serious attention and assistance to our customers has made us an office furniture provider to over 100,000+ businesses, institutions and individuals worldwide. We look forward to serving you too. Most items are in-stock or ship within a few short days. Modern Office is known for offering a large selection of quality business furniture from over 100 manufacturers at discount prices -- not just the limited colors or sizes you may see elsewhere. Shipping is free whether you are in New York City, Miami, Chicago, Los Angeles, or anywhere in the 48 contiguous states. There are many benefits to signing up for our newsletter including exclusive offers, coupons, latest company news, ... and much more.